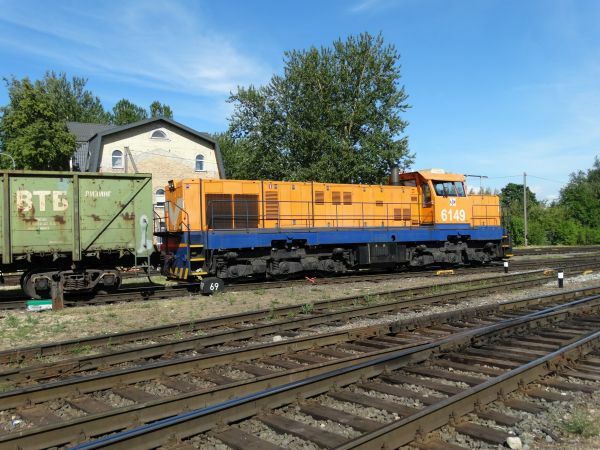 This is one of Latvia's most modern locomotives, one of the ČME3M shunter machines. It is actually an old Soviet ČME3 (also written as ChME3) but so totally modernised that it is beyond recognition. Only the underframe has been left of the old machine and the whole upperparts, engines etc are all new. A closer look at the same ČME3M shunter as above. 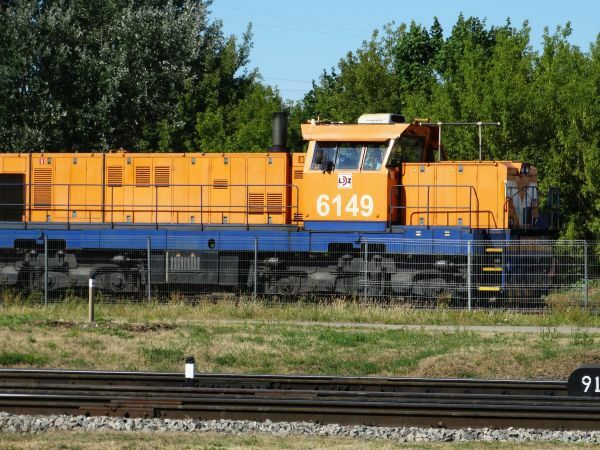 It is fitted with a Caterpillar 3512C HD engine. It is dieselelectric and the maximum speed is 90 km/h. First prototypes were built 2011 and the first machines were taken in normal use in 2014. Still the same locomotive as above, but seen from the other side. It looks very modern and fine. The machine is built by CZ Loko. 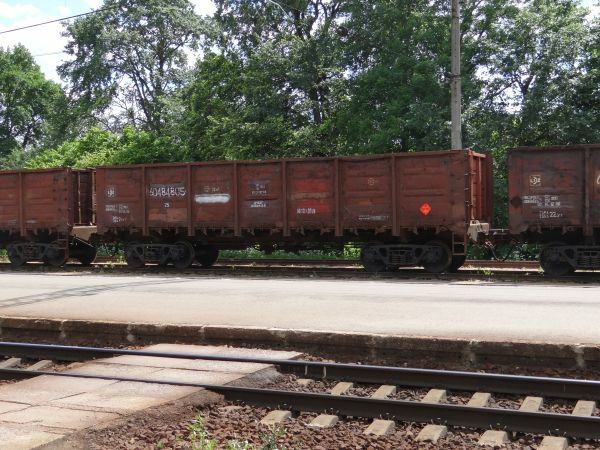 Typical Latvian Soviet style cargo wagons have texts both in western and in cyrillic alphabet texts. Picture at Salaspils station 15.6.2013 by Ilkka Siissalo. 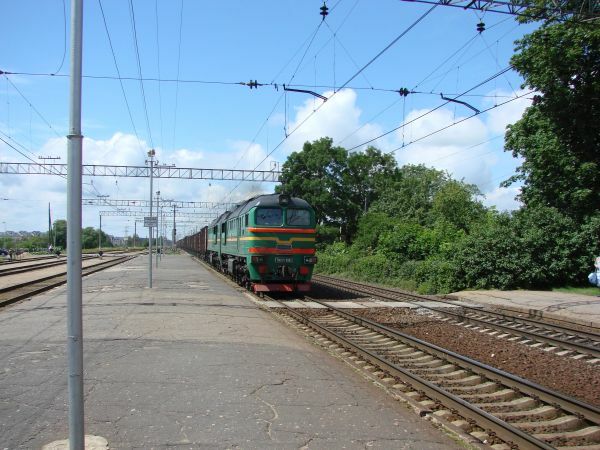 The station of Salaspils south of Riga is one of the best train photography places in Latvia. It is easy to reach and there is both suburban and longer distance passenger traffic as well as heavy cargo trains. 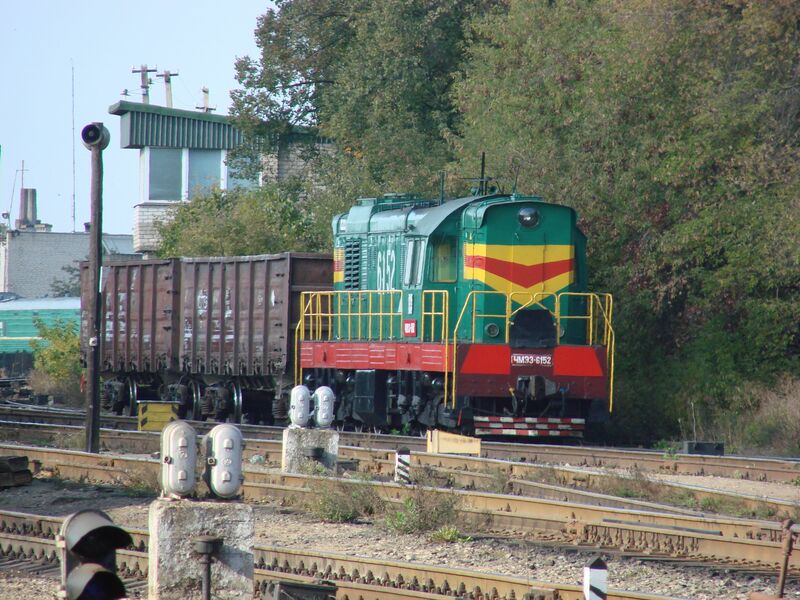 And with a long telephoto lens one can spot the approaching trains already from really far away. 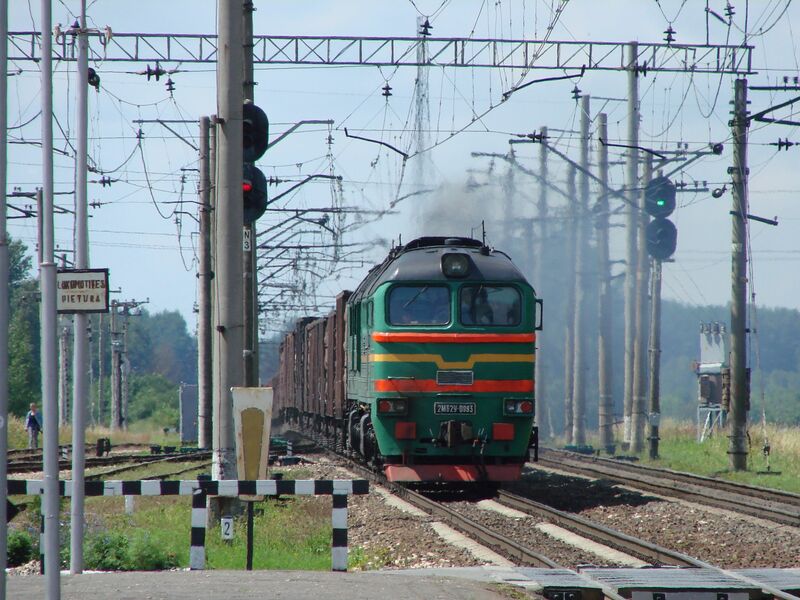 Picture at Salaspils 15.6.2013 by Ilkka Siissalo. It's getting closer. Now it's already possible to see that the approaching locomotive is the very old but huge class 2M62 from the beginning of the 1960s in classic Soviet railways paintings. 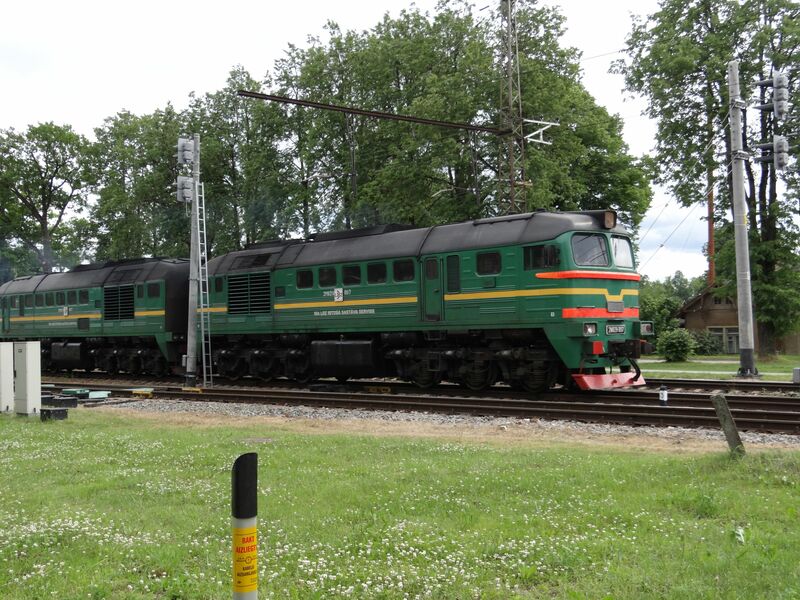 Picture at Salaspils 15.6.2013 by Ilkka Siissalo. ...and from this distance it's possible to note that this is not one of the "basic" 2M62 models, but a 2M62U which has more modern engines. 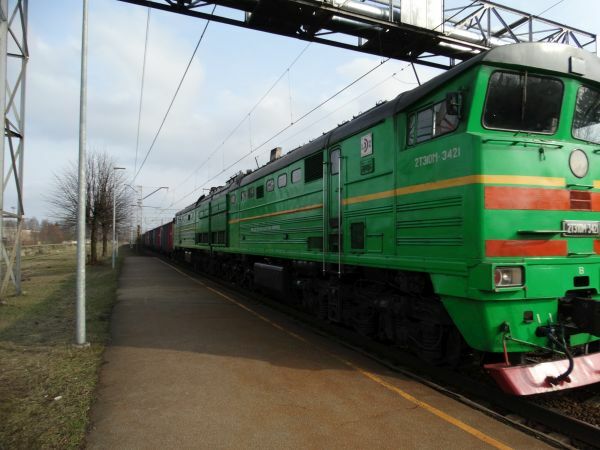 Note that the signs at the front of the locomotive are in Russian cyrillic text only. Picture at Salaspils 15.6.2013 by Ilkka Siissalo. 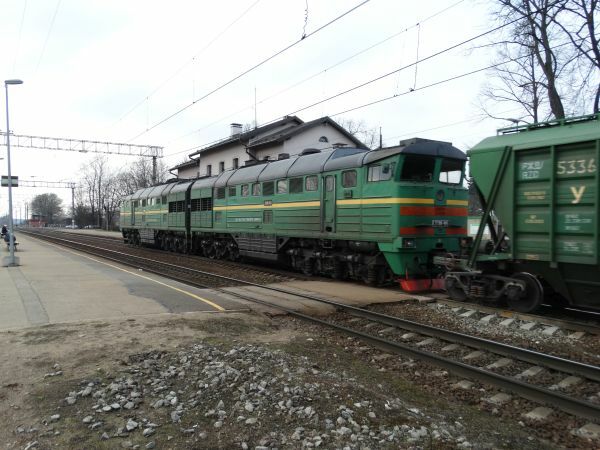 The old 2M62U is a twelwe axle double locomotive. Together with a typical Russian crude oil train - which are often 45 to 48 coaches long - it's a mighty and noisy train. 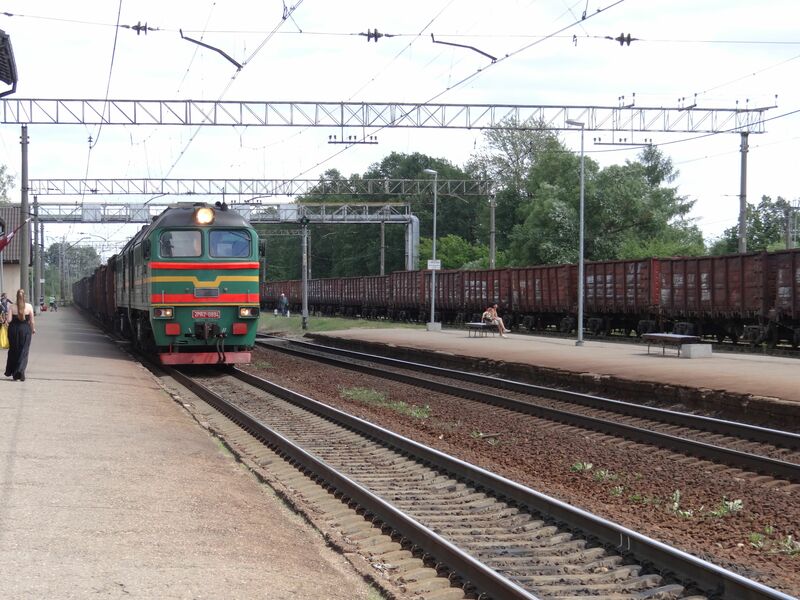 Picture at Salaspils 15.6.2013 by Ilkka Siissalo. A 2M62 consists of two parts, each weighing 116,5 tons (!) 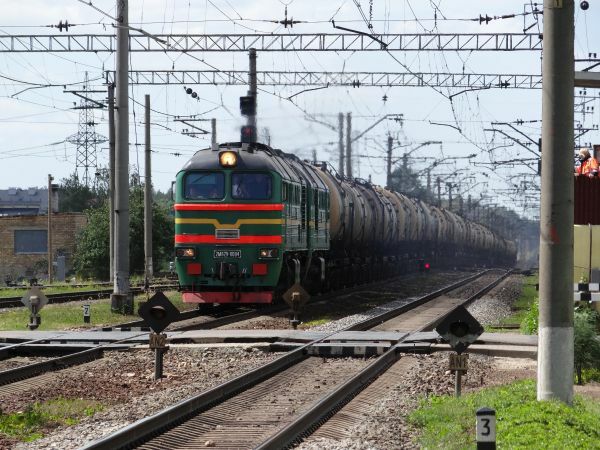 These monsters can damage railroad tracks easily. 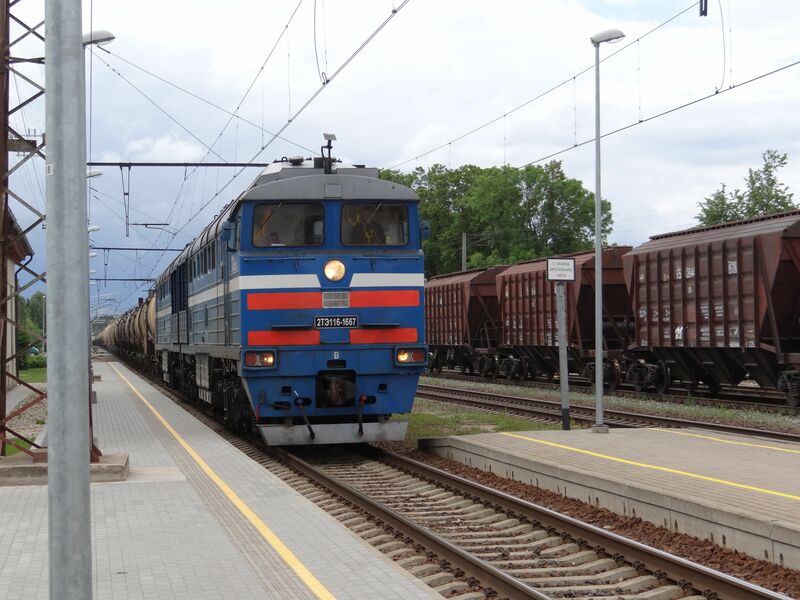 Picture at Salaspils 15.6.2013 by Ilkka Siissalo. 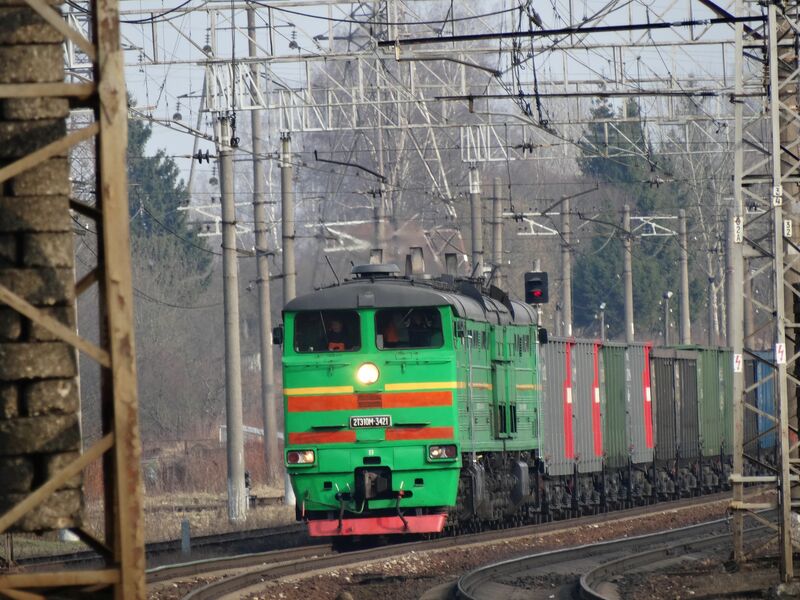 Another 2M62, but this time not the U-version, but the "basic" model, hauling a train loaded with coal towards the west. 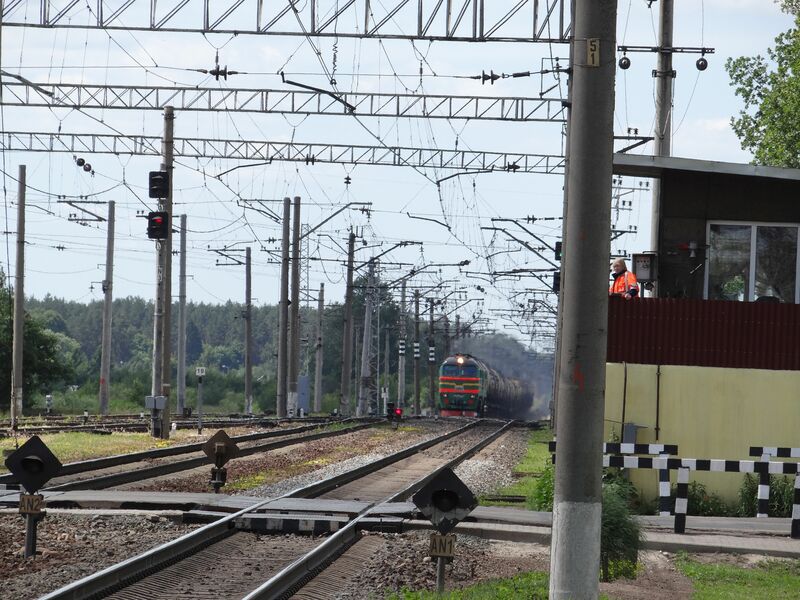 Picture at Salaspils 15.6.2013 by Ilkka Siissalo. Yet another 2M62U approaching Salaspils with a heavy train. Picture at Salaspils 4.7.2007 by Ilkka Siissalo. 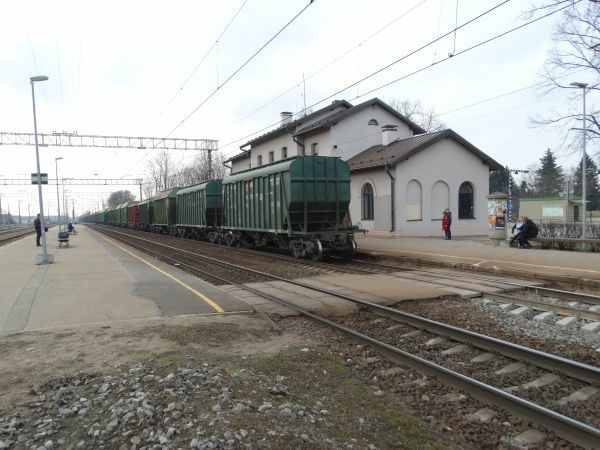 Same train as in the picture above, but now seen closer by. The noise is deafening. 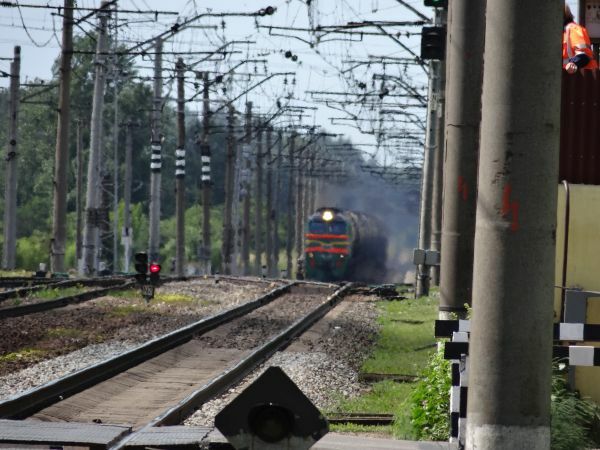 Picture at Salaspils 4.7.2007 by Ilkka Siissalo. Side view of yet another 2M62U machine. 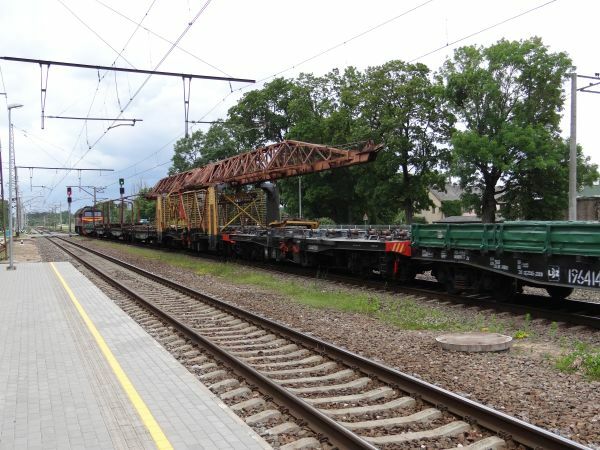 Picture close to the Sidgunda station 25.6.2015 by Ilkka Siissalo. 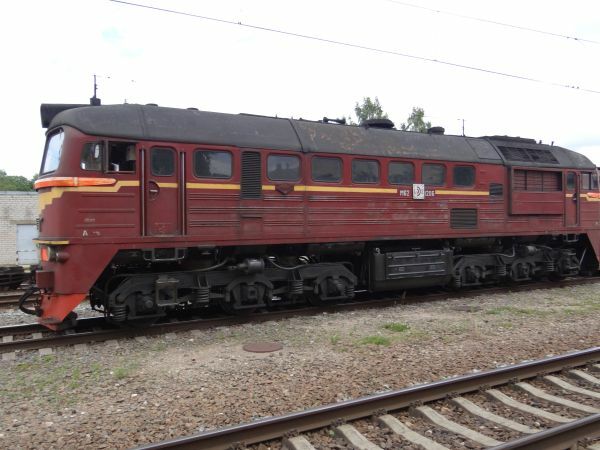 A rare sighting of one of the oldest M62 locomotives; not the 2M62 double locomotive, but the single unit one and still in the very old red paintings, here pulling a track maintenance train. Picture in Skriveri 25.6.2015 by Ilkka Siissalo. Same train as above. It's easy to see that this locomotive is really old. Picture in Skriveri 25.6.2015 by Ilkka Siissalo. Still the same train as above. This is clearly equipment for track renewal. Picture in Skriveri 25.6.2015 by Ilkka Siissalo. A similar old M62 doing shunting at the station of Škirotava near Riga. Picture 27.6.2018 by Ilkka Siissalo. In addition to the 2M62 also the Russian model 2TE10 is quite common in Latvia. This one is a version 2TE10M, a twelve axle monster built in Luhansk, eastern Ukraine since 1981 in over 2400 copies. These machines one can find (with some luck) in Russia, Belarus, Ukraine and Latvia, but nowhere else. Top speed is 100 km/h. 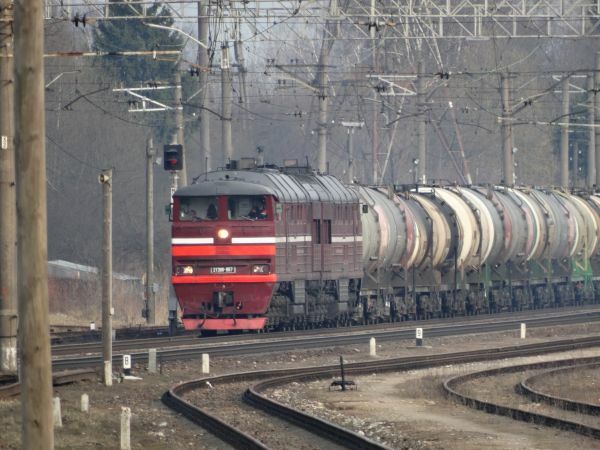 Picture at Salaspils station 1.4.2017 by Ilkka Siissalo. It's like an earthquake when you stand close by. 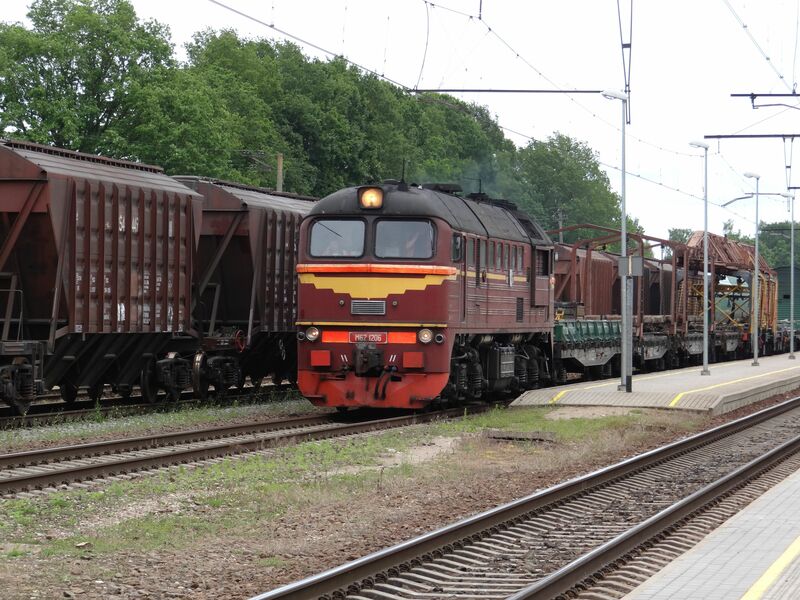 A Latvian state railways LDZ class 2TE10M rumbling past. Picture at Salaspils station 1.4.2017 by Ilkka Siissalo. The 2TE116 model is currently the most modern cargo locomotive - with the exception of some modernised shunter machines - and still a very short time ago LDZ didn't have any of these. It also was - and still is - produced in Luhansk, eastern Ukraine. The machine weighs a mighty 272 tons. Picture 1.4.2017 at Salaspils by Ilkka Siissalo. 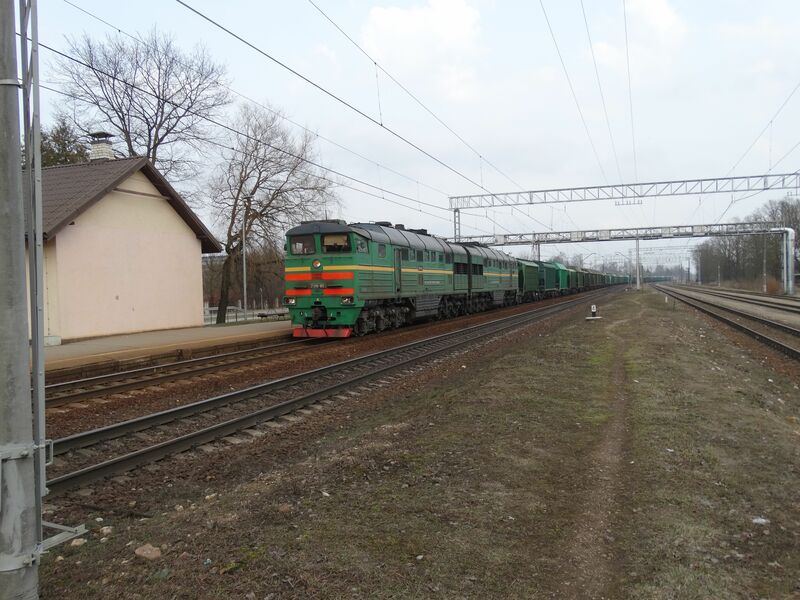 Another picture of the same 2TE116 as above. Picture 1.4.2017 at Salaspils by Ilkka Siissalo. Still another picture of the same 2TE116 as above. 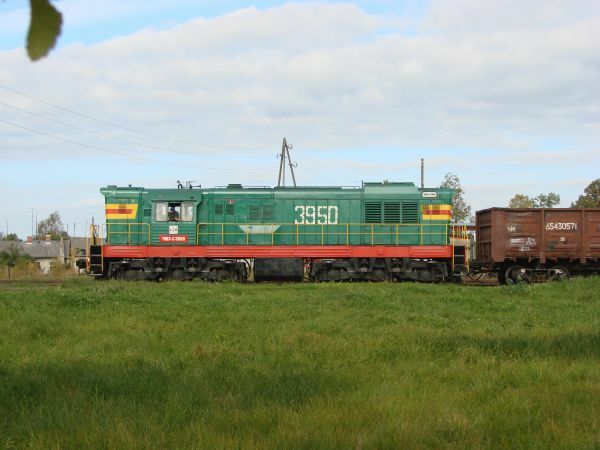 It is registered to the company "LDZ Ritošā sastāva serviss" which is a daughter company of the Latvian state railways LDZ. Picture 1.4.2017 at Salaspils by Ilkka Siissalo. 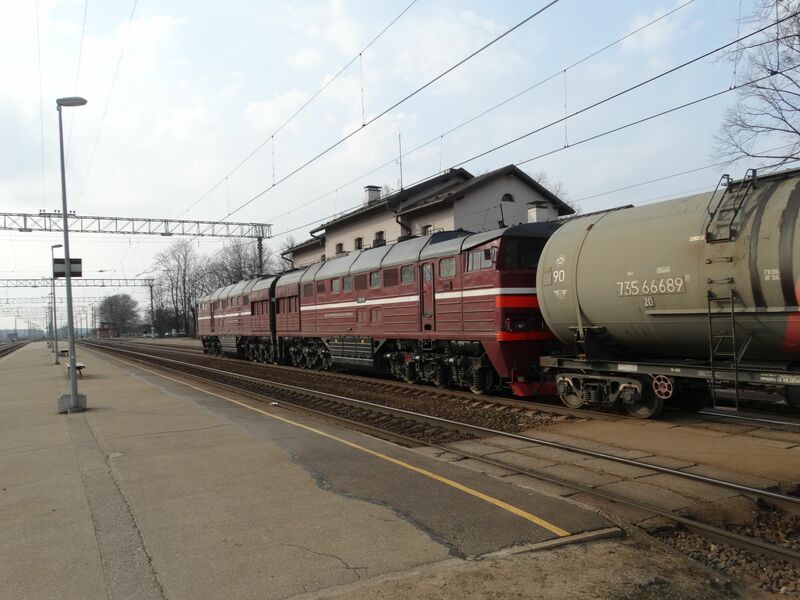 Another 2TE116, it also registered to the company "LDZ Ritošā sastāva serviss". Picture 1.4.2017 at Salaspils by Ilkka Siissalo. 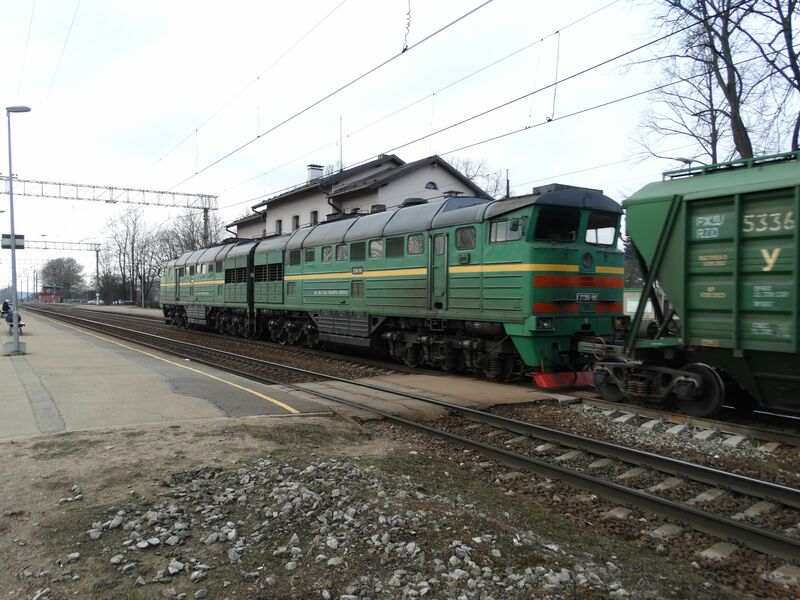 Another picture of the same 2TE116 locomotive as above. Picture 1.4.2017 at Salaspils by Ilkka Siissalo. 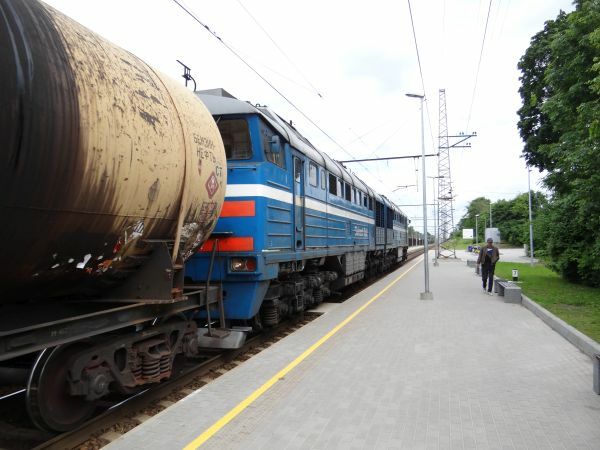 The train that the 2TE116 pictured above was hauling was loaded with ore wagons of the company "URALCHEM", which produces for example fertilizers. 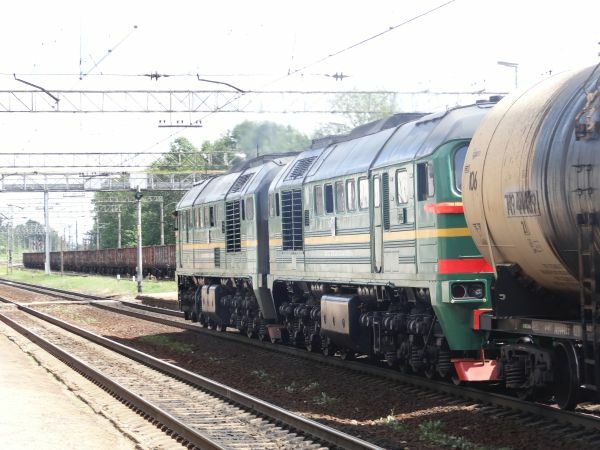 These locomotives can pull extremely heavy trains. Picture 1.4.2017 at Salaspils by Ilkka Siissalo. An old but repainted ChME-3 switcher working near the harbour of Riga. Picture 25.9.2008 by Ilkka Siissalo. 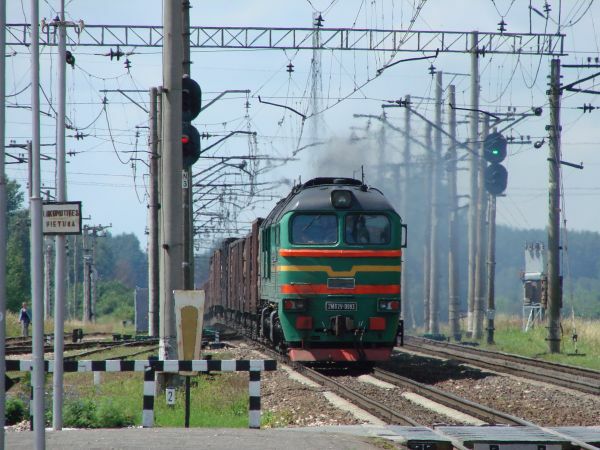 Another ChME-3 in Gulbene. 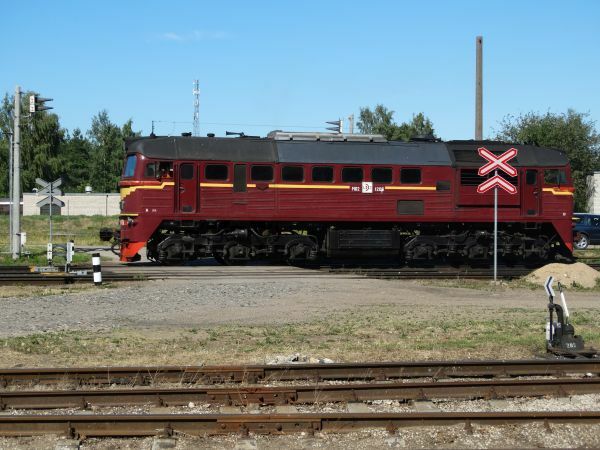 Note how it is typical for the Latvian state railways still to have the locomotive types painted on the sides of the locomotives in Russian cyrillic texts only. 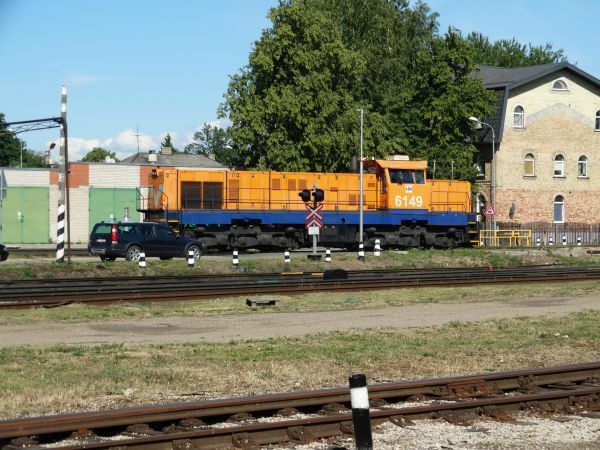 Picture in Gulbene 25.9.2008 by Ilkka Siissalo. 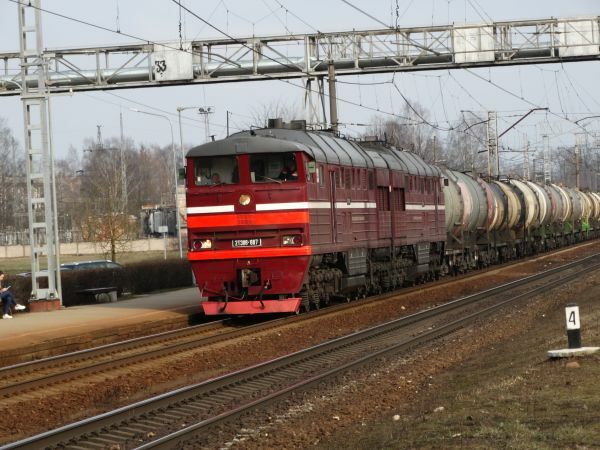 There is very little private cargo train traffic in Latvia, but here is one example: This is a 2TE116 locomotive owned by the private company Skinest Rail pulling a long rake of Russian crude oil wagons. Picture at Skriveri station 25.6.2015 by Ilkka Siissalo. The same train as above, but here getting closer. 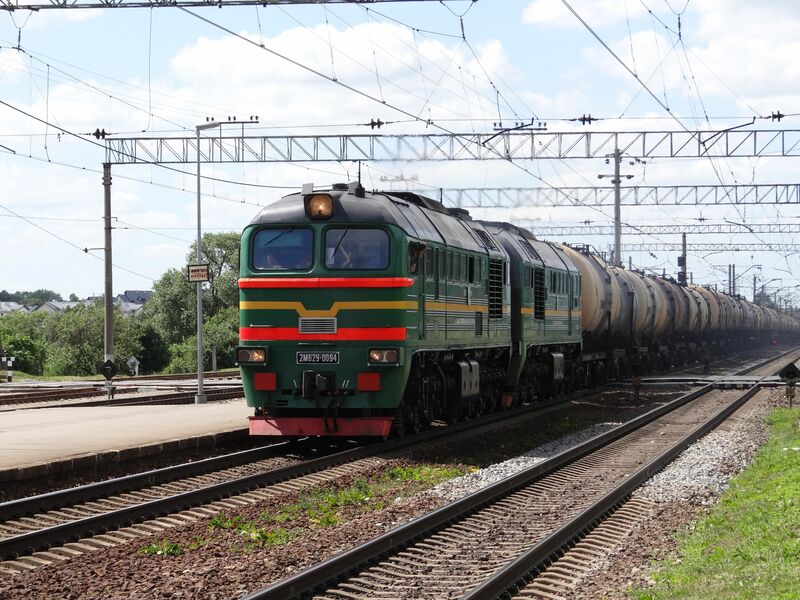 Picture at Skriveri station 25.6.2015 by Ilkka Siissalo. Still the same train, now rolling past the photographer. 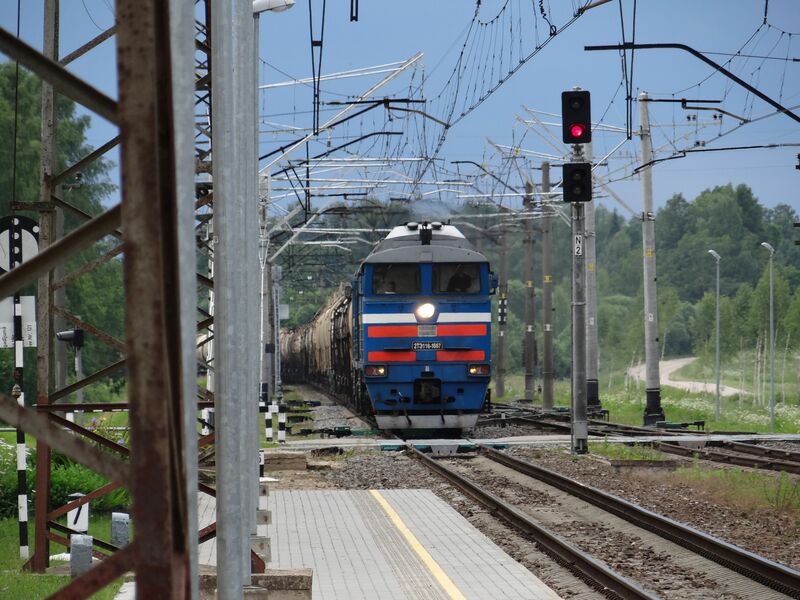 Picture at Skriveri station 25.6.2015 by Ilkka Siissalo.